bodies and how confident they feel about their appearance. supported the construct and concurrent validity of the C-PSPP. However, a number of significant cross-loadings were emerged. reported by Hagger, Biddle, and Wang (2005). PSPP and acceptable test-retest reliability over a 2-week period. their physical condition (Welk & Eklund, 2005). tionnaire instrument requires an ongoing work (Fox, 2000). populations should be further scrutinized. ing the utility and generality of this model (Hagger et al., 1998). as human well-being and motivation. for Children (SPPC) corresponding subscales (Hypothesis 4). across the grades (Hypothesis 7). formed the shuttle run test to examine criterion-related validity. 4-point rating scale written in a “structured alternative format”. in SDC scale could range from 0 to 10.
two groups as either sport participants or non-sport participants. and with the assistance of one of the authors. Corbin (1989) was examined (Model A; see Hypothesis 1). spectively (Hoyle & Panter, 1995; Hu & Bentler, 1999). students’ scores in the CY-PSPP subscales. rions indicating an adequate overall fit of the model to the data. factor were moderate (range: .20 - .51; Table 1). GSW (.82, p < .001). 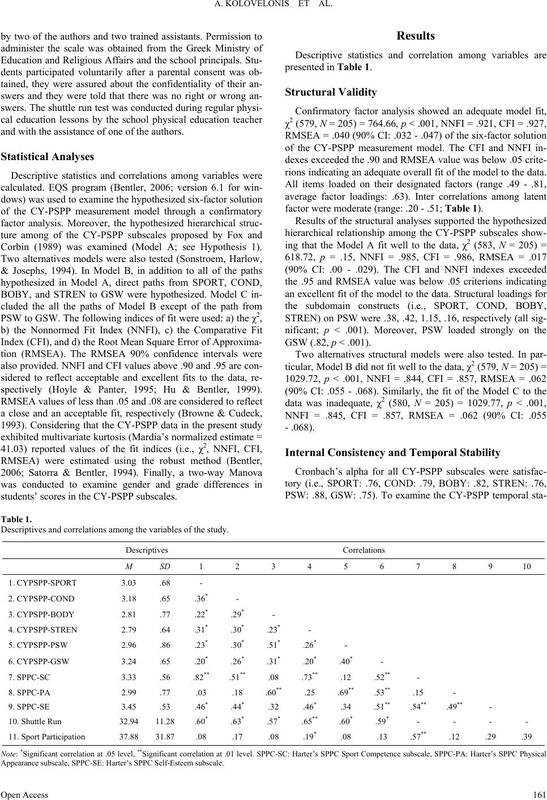 Descriptives and correlations among the variables of the study. Appearance subscale, SPPC-SE: Harter’s SPPC Self-Esteem subscale. the three subscales of Harter’s PSPC are presented in Table 1. Harter’s SPPC (r: .82, .60, .51, respectively). = 5.87, p = .017, partial η2 = .029. (r: .02, .19, −.15, −.10, −.07, −.11, respectively). properties of the Greek version of the CY-PSPP questionnaire. Welk et al., 1995; Welk & Eklund, 2005; Whitehead, 1995). 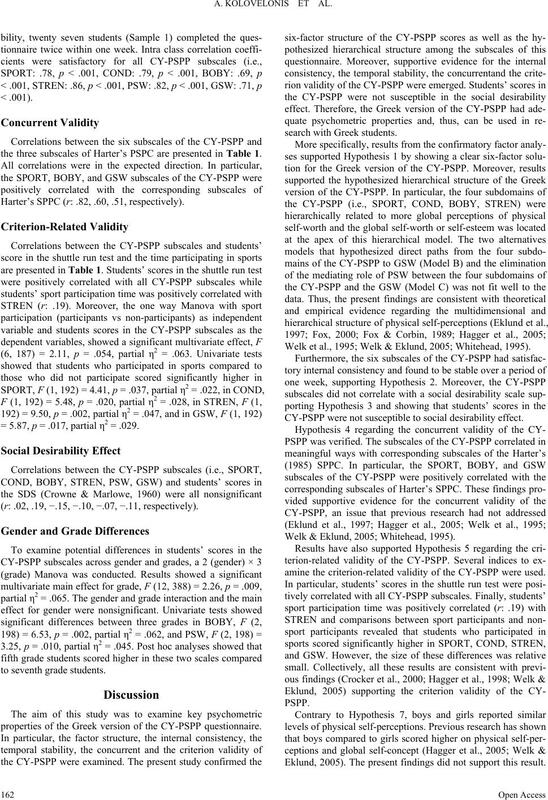 CY-PSPP were not susceptible to social desirability effect. Welk & Eklund, 2005; Whitehead, 1995). amine the criterion-related validity of the CY-PSPP were used. Eklund, 2005). The present findings did not support this result. study the sample size was relative small to examine this issue. perceptions can be evaluated through the use of the CY-PSPP. evidence base for this measure. Asci, F. H., Eklund, R. C., Whitehead, J. R., Kirazci, S., & Koca, C.
chology of Sport and Exercise, 6, 33-50. Bentler, P. M. (2006). EQS 6 Structural Equations Program Manual. Encino, CA: Multivariate Software, Inc.
Biddle, S., Page, A., Ashford, B., Jennings, D., Brooke, R., & Fox, K.
tional Journal of Adolescence and Youth, 4, 93-109.
equation model (pp. 136-162). Newbury Park, CA: Sage. 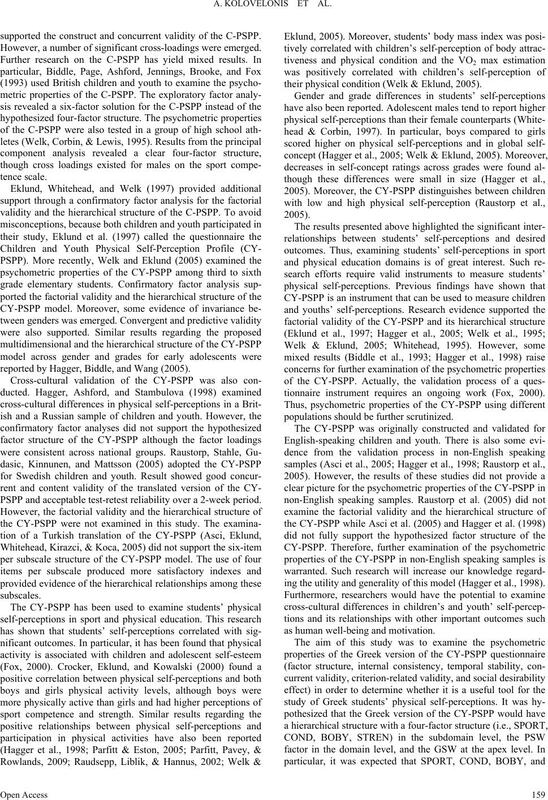 tional Journal of Sport Psychology, 3 1, 228-240.
tion. 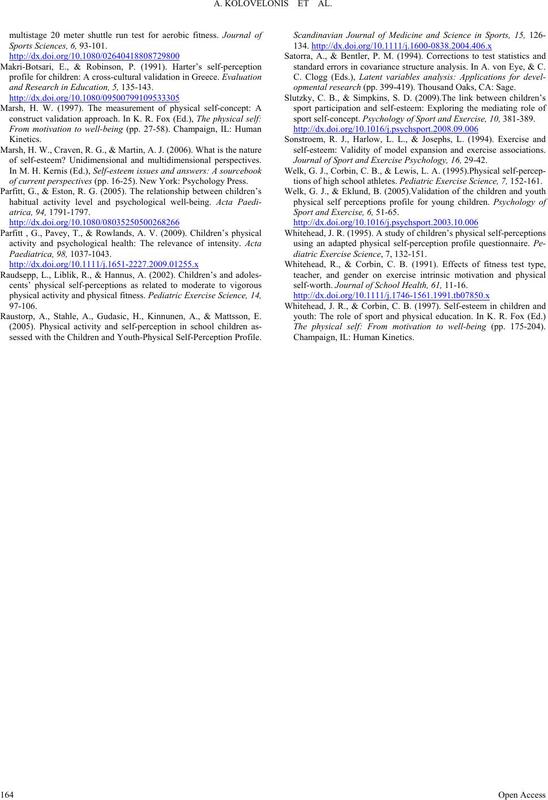 Pediatric Exercise Science, 10, 137-152. Harter, S. (1985). Manual for the self-perception profile for children. Denver, CO: University of Denver Press. Kolovelonis, A.,Goudas, M., Hassandra, M., & Dermitzaki, I. (2012). and Research in Education, 5, 135-143.
of self-esteem? Unidimensional and multidimensional perspectives. of current perspectives (pp. 16-25). New York: Psychology Press. Raustorp, A., Stahle, A., Gudasic, H., Kinnunen, A., & Mattsson, E.
sessed with the Children and Youth-Physical Self-Perception Profile. standard errors in covariance structure analysis. In A. von Eye, & C.
opmental research (pp. 399-419). Thousand Oaks, CA: Sage. sport self-concept. 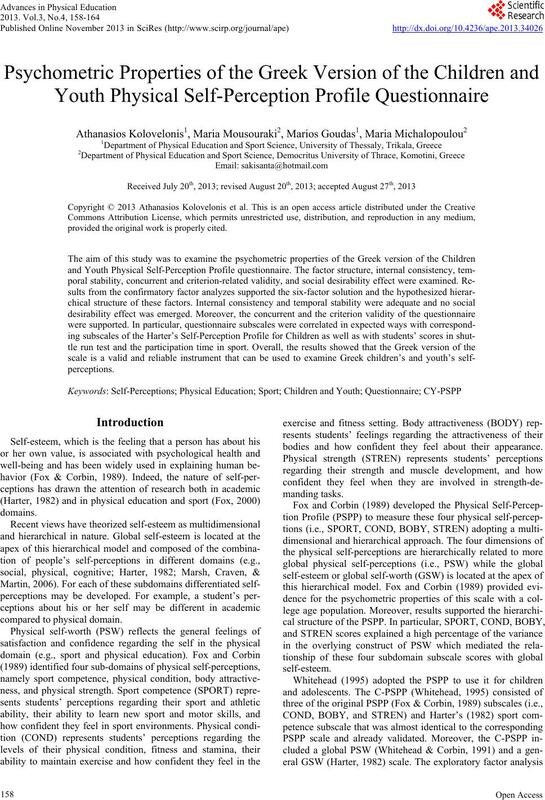 Psychology of Sport and Exercise, 10, 381-389.
self-esteem: Validity of model expansion and exercise associations. 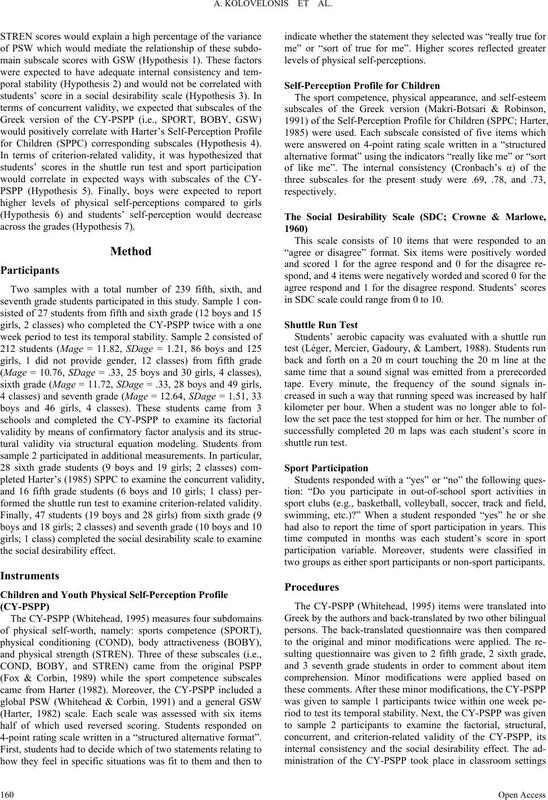 Journal of Sport and Exercise Psychology, 16, 29-42.
tions of high school athletes. Pediatri c Exercise Science, 7, 152-161. Sport and Exercise, 6, 51-65.
diatric Exercise Science, 7, 132-151.
self-worth. Journal of Schoo l He a lt h , 61, 11-16. The physical self: From motivation to well-being (pp. 175-204).